I've been meaning to share this kit with you for a while now, but one thing was standing in my way...I first had to put it together! 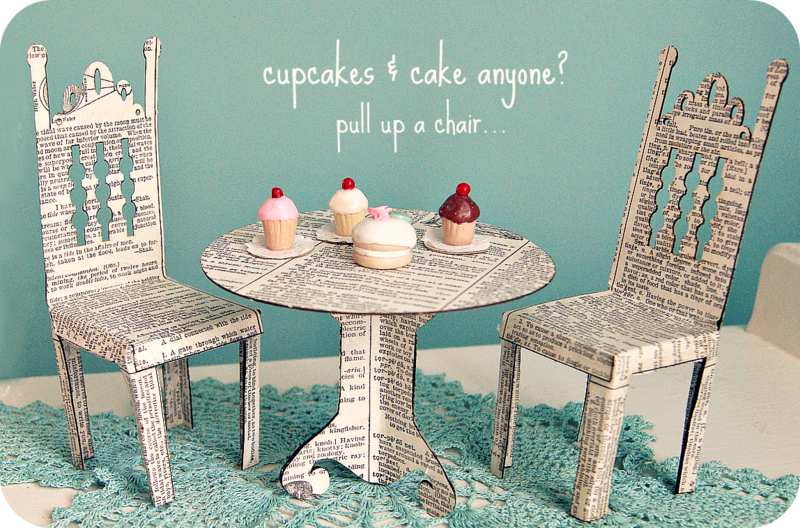 This beyond adorable mini table and chairs is made simply of vintage dictionary papers and paper board. I've had it for far too long...stashed away for a rainy day. And guess what?... yesterday was that rainy day! I picked it up last October while teaching at Art Is...You. 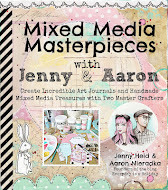 It is just one of many amazing kits created and produced by Navel Jelly Studios. One drawback in teaching and vending at these amazing art events is that your busy schedule causes you to kinda miss out on seeing the dazzling goods that are being offered up by the other ridiculously talented instructors. With all the last minute running around (it's a common occurrence for teachers to be doing last minute class prep in their hotel rooms...glitter in carpets anyone?) And then full days in your own classrooms. In this case it just so happened that the night we arrived, Taryn, the gal behind Navel Jelly Studios, is also a night owl and was putting the finishing touches on her booth for the next day. And lucky for me, I had Aaron to unload boxes while I may or may not have wandered away to hawk some goodies. In Navel Jelly's booth I spied so many amazing bits, and Taryn was sweet enough to put them to the side for me. This kit is one of them. It is part of a collection of paper craft kits called Paperlings. I had so much fun putting together my mini table and chairs. The kit comes with all you need except for glue! The directions recommend scissors, glue stick, tacky glue, and toothpick. 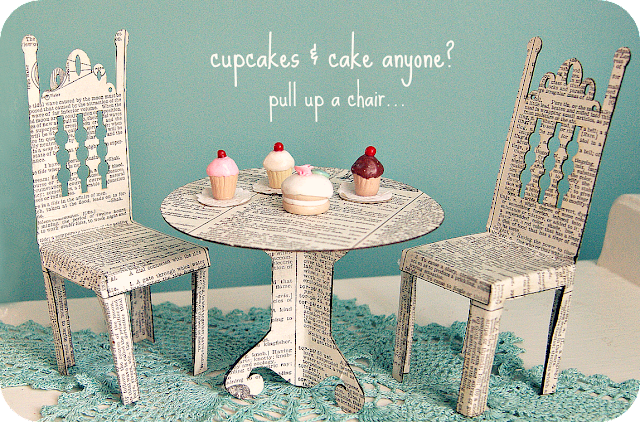 I myself always wing it...and used mod podge and a glue gun. That's how I roll. (but I'm gonna get all Mom and Dad on you here and tell you "Do as the directions say, not as I do" unless you too roll like that...in that case - I say Party!) It all came together so quickly and I seriously adore this little set! And guys, are you ready for this?...it was only 6.95! Yeah sure, you can say it's just paper...and yeah, you gotta make it yourself...but it's mega cute...and everything is here for you...and laser cut! And making things is fun! I can't say enough good things about Navel Jelly Studios. 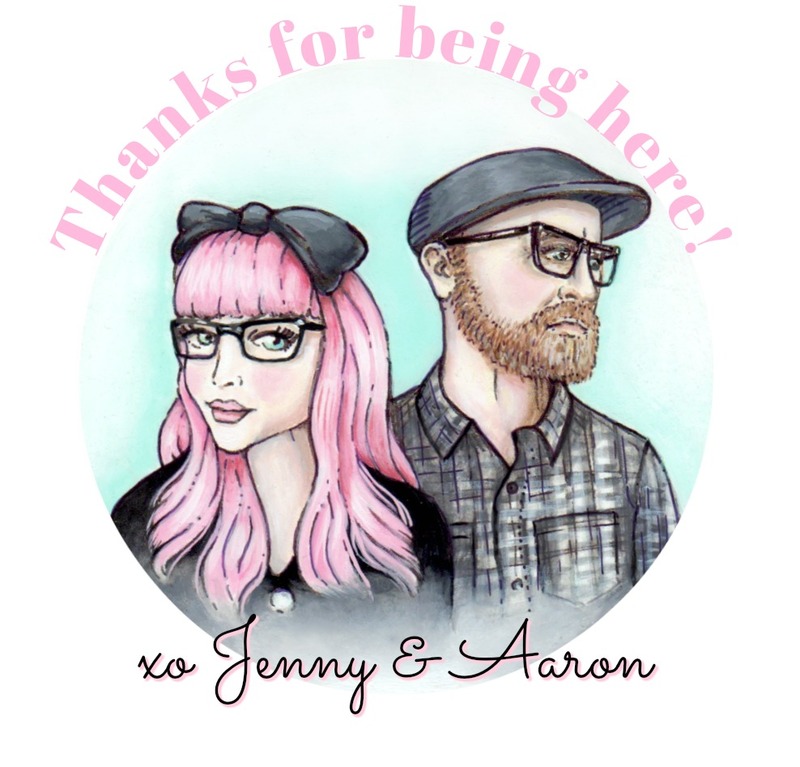 If you are looking for unique ephemera, supplies, and kits with an antiquey feel...visit their shop! 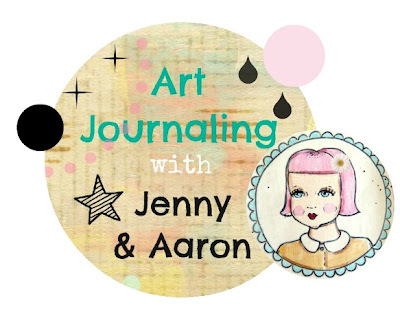 And thank you so so much for all of the enthusiasm toward the new Art Journaling with Jenny & Aaron series! We are so so psyched for Thursday! And I'm happy you guys liked the DIY stamps! I'd love to see yours! Okie Doke... back to work! Oh, that is too adorable!! I'm loving that little "display table" kit in her shop too! @Kelsea Echo Isn't it?! Seriously...everything they sell is fantastic!! And Taryn is super talented!! Her classes always look amaazing!! We've popped in on a few...such fantastic things! And their booth at the vendor night is always HUGE!! like a pop up shop/store! I know what you mean about not having enough time to look around at events. I have never taught at one, but the craft shows that I have done, I have been super frantic and never get enough time to look around at enough of the awesome stuff! D'aww it's so cute, I don't think I've ever appreciated paper so much! Oh my heck! How cute is that! I just love mini things! I'm working on a tiny cake and tea setting for a lovely colleague. Sooooooo fun and adorable!! LOVE IT!!!! @Vintage Grey Thanks!! yeah, it was fun to put together! :) Ohh we are so excited about Thursday too!! See you then!! @Amy.. thanks!! I know! So simple..yet such an amazing outcome! I love it! :) Thanks for visiting! @Julie Tucker-Wolek Thanks!! All of their kits are great! I have a few. This was such a perfect little project for a rainy Sunday! I was like a 6 yr old when I finished it! :) Beaming! haha! hi doll! 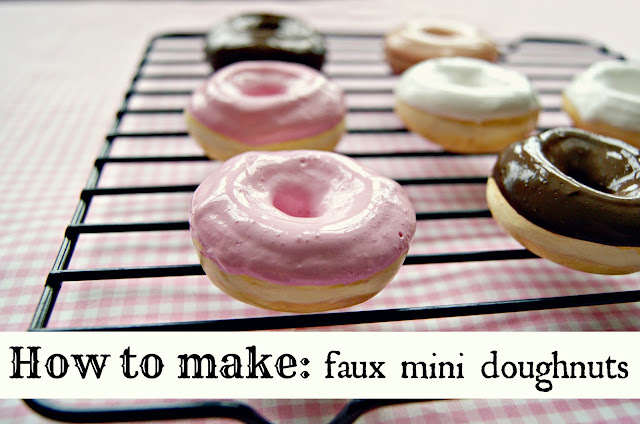 such a cute blog!